In 1864, Frederick Warren, a young man of exceptional abilities from Three Oaks, a village near the eastern shore of Lake Michigan, then soldier in the Civil War (12th Regiment of the Michigan Infantry), read an article for the Difference Engine of Charles Babbage. Inspired by this article, he decided to create a calculating machine himself. Warren definitely had the knowledge and skills to do this, as he was an educated, energetic and intelligent man, who used to work as a teacher, itinerant photographer and watchmaker, but nevertheless this hardship will take him more than 10 years, and he managed to finish a reliable working model as late as in the spring of 1875, only several weeks before his early death of tuberculosis on April 9, 1875. 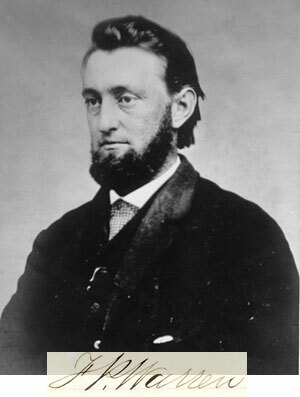 Following his death, his brother Edward Kirk Warren (see the nearby photo) exhibited the device around Michigan and Indiana for a short time before his health began to deteriorate. Edward admitted the machine was so complex that after Fred's death he was unable utilize it to its fullest capabilities. Edward will become later a famous American multi-millionaire industrialist, philanthropist, civic leader and inventor (E. K. Warren is a holder of 3 US patents—№№286749, 311621 and 559827). 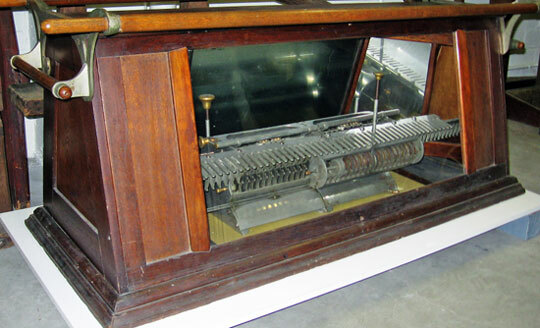 Fred Warren had always been interested in machinery and sciences, and in 1864 he decided to build a machine capable of doing complex mathematical equations. Warren stated he did not build the machine for manufacture or sale (that's why the device had not been patented), "but to see what was possible to accomplish by mechanism." The so called Warren Calculating Engine is a mechanical arithmetical calculator that can add, subtract, multiply, divide, and calculate interest, with some of these operations able to be done simultaneously. Three models of the machine of Warren survived to our time. The first and second model appear incomplete and are kept now in the collections of National Museum of American History, Kenneth E. Behring Center, while the third seems a workable device and is in the collections of the Michigan State University Museum. The first model (see the upper image), finished by Warren in 1872, is a brass, ferrous metal and paper made device, with overall measurements: 12.5 cm x 28.5 cm x 19.2 cm. It has a row of 11 result dials that slide along the back. Each dial has a strip of paper numbered from 0 to 9 twice around the rim. Between the dials are spiral gears, which were to be part of the carry mechanism. In front of the dials and gears is a row of seven gear segments. In front of and linked to these are seven additional gear segments. A lever that extends to the front of the machine can be placed in any tooth of one of these forward segments. At the top of the machine is a tilted disc that has four toggles protruding from it. 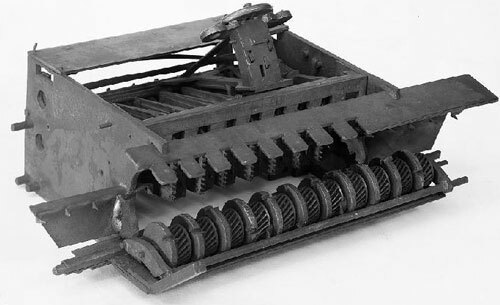 The second version of Warren's calculating machine (see the second of upper images), finished by Warren in 1874, is a brass and ferrous metal made device, with overall measurements: 18.2 cm x 66.3 cm x 30.2 cm. Across the front is a brass rod with ten large teeth, one shorter one, and a hollow brass cylinder. Between the teeth are ten levers that link to toothed segments at the back of the machine. The front and back are open; the sides are of a ferrous metal painted black. At the top is a hollow brass rod, mounted across the machine, which has two brass circular structures on it. This is used as a plunger to activate the mechanism. Brass rods with large teeth extend from both sides of the back. 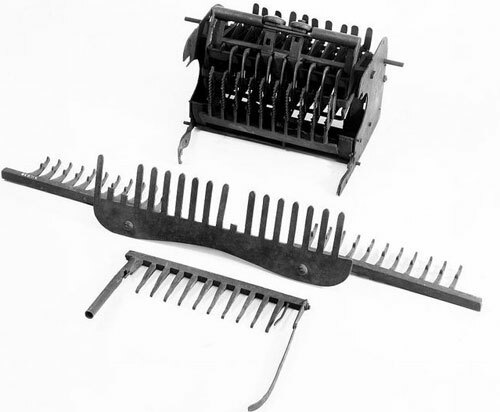 There also is a ferrous piece in the shape of a large comb that is attached to the top back of the piece. 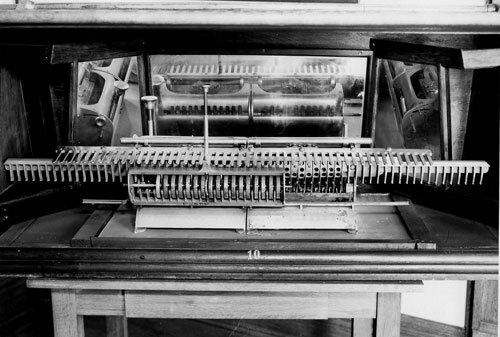 The third machine of Warren (see the lower image), finished in 1875, kept now in the MSU Museum collections, looks like a genuine workable mechanical calculator. The device is made of nickel-plated iron or steel with brass knobs. The dials are silvered and illumined by a system of kerosene lamps. Through a slit the numerals were reflected on a screen so an audience of several hundred people could easily see the calculations! The machine contains over 2,100 specially formed pieces and over 3,000 total pieces including screws and rivets. Aside from the movable carriage that holds the number wheels, the rest of the machine is actually two identical units placed side by side that could be operated together or independently. Who was this remarkable man—Frederick Warren? 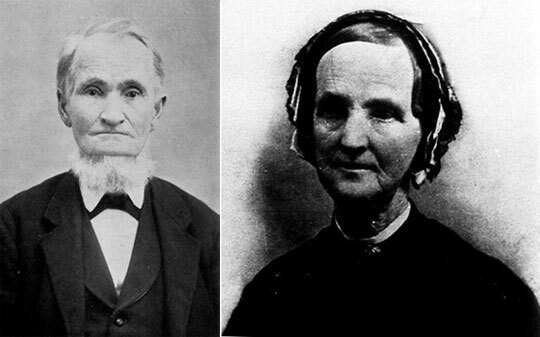 Frederick Parsons Warren was born on 30 March 1839 in Trumbull, Fairfield, Connecticut, in the family of Reverend Waters Warren (1801-1888) (see the lower photo), who was a minister in the Congregational church, and Caroline Clarissa Parsons (1813-1893). Frederick was descended seven generations from an early American family—Jacob Warren (b. 1604) came to the colonies in 1635 from Weymouth, England. Frederick had an older brother, Charles Henry (1836-1859), and two younger brothers—Albert Larue (1842-1931) and Edward Kirk (1847-1919). Fred Warren's schooling have been limited to the public schools of Vermont, New York and Massachusetts, where his father was holding pastorates in 1840s and 1850s. In 1858, the family settled in Three Oaks, Michigan. 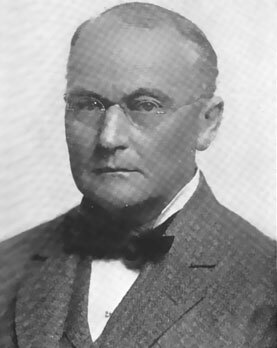 Frederick Warren carried on an earnest campaign for numerous improvements in Three Oaks, and devoted considerable space to urging of new industries, such as a cheese factory, which would be of prime benefit to the farmers of the region. He also operated a jewelry store, a watch repair shop, and a photograph studio. Frederick Warren was the editor of the Reveille, Three Oaks first newspaper, in which he demonstrated his originality and freshness of style. The publishing began on Oct. 5, 1872. The Reveille, though a success in every way, was short lived (only 6 issues had been printed). Its publication was suspended on February 22, 1873, when Warren was forced to his bed by illness from which he never recovered.